Tonight I had a hankering for sausage and greens. It just sounded warm and comforting and yummy, you know? So I stopped at one of my favorite stores after work – Kreigers. 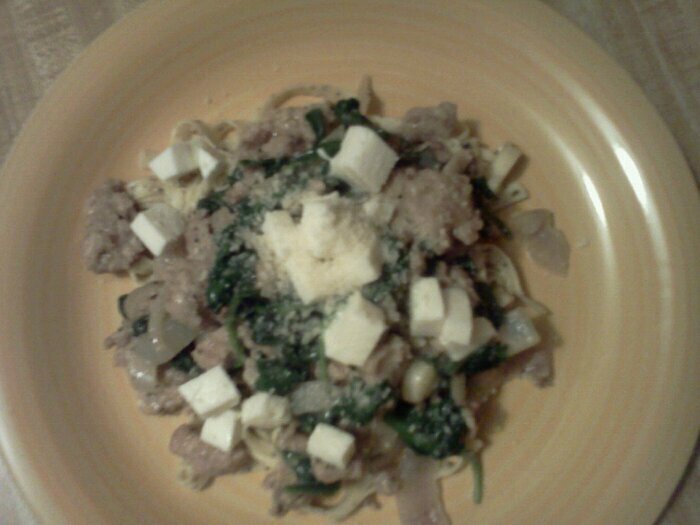 I picked up some ground pork, baby spinach and a new spice blend and threw together this pasta dish. I admit it – I really bought it because of the label. I’m always happy when a no-recipe dish turns out well, and this was quite tasty. Pasta and The West Wing on DVD…nothin’ better on a Wednesday night! 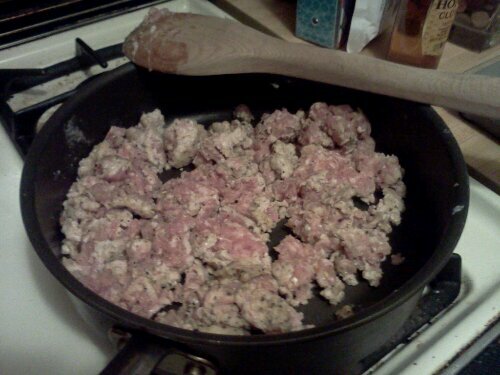 I started by browning a pound of ground pork in a large skillet (at the same time, I started the water for the pasta). 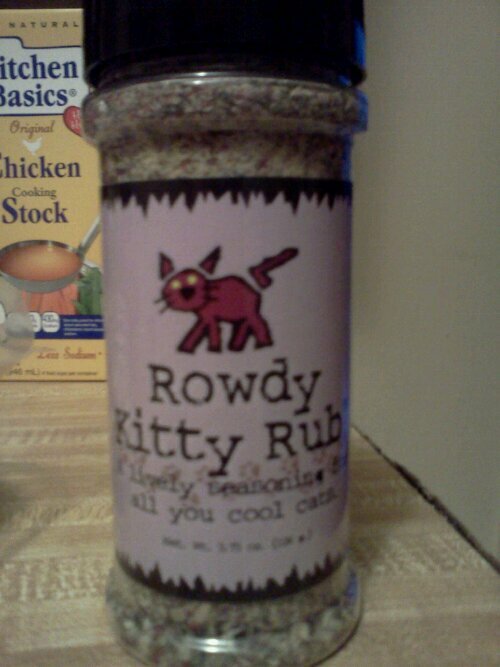 I added a few tablespoons of flour and some of the Rowdy Kitty Rub to the pork. 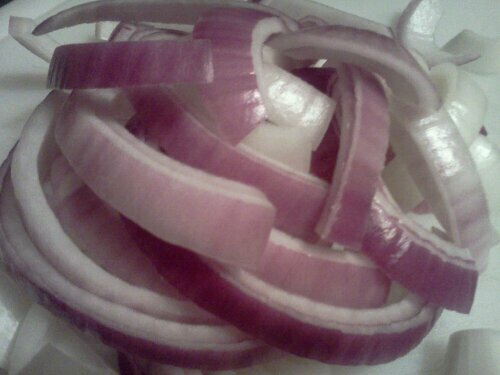 Once the pork started to brown, I added a sliced red onion and three big cloves of garlic, sliced. I added some salt, and keep on cooking. I thought this was a pretty picture. After the onions and garlic started to get soft, I added about a cup of chicken broth and turned the heat up to high to reduce it. I let the sausage mixture thicken up, then turned the heat to low, stirred in a handful of grated parmesean cheese and added two big handfuls of baby spinach. 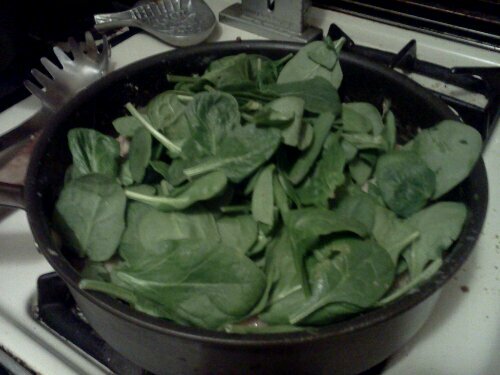 I covered the skillet and let the spinach wilt. By now, the pasta water was boiling, so I cooked some black pepper pasta while I waited for the sausage and spinach mixture to be done. 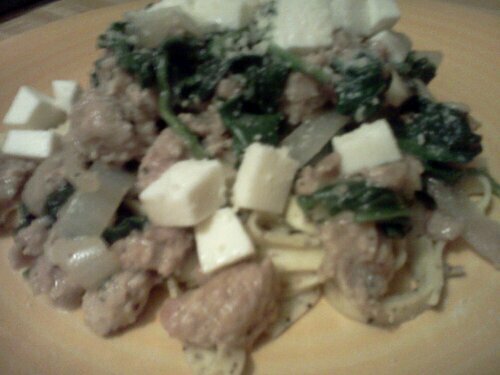 This entry was posted in Dinner, General and tagged comfort food, ground pork, pasta, sausage, spinach on February 20, 2013 by Melissa. Sausage and greens with pasta sounds great to me! I threw mine into soup last night, and we had a soup off (kinda like a dance off) between Caldo Verde and Swedish Wedding Soup. Everyone won, I’m a crappy judge . . . I love that you found and used a new spice mix in the same day. I’m always picking stuff up at Penzey’s because it looks good, then mulling over what to do with it for a month before I finally try it. Those soups both sound great – I can see why everyone won! A lot of times I do the same with spices, this one just worked out. I love Penzey’s too – they’re the best! These same ingredients in soup sound good to me too! Also, we are Penzey’s junkies and especially love specific Penzey’s spices for very specific dishes. My husband Kim uses Southwest seasoning every time he makes a rotissierie chicken on our grill. We love the Ruth Ann’s one on zucchini and yellow squash sauteed, Galena Street on grilled pork chops, and on and on and on! We are Melissa’s Aunt and Uncle, by the way. By the way Melissa, you are an awesome cook! That sausage mixture looks great, and I bet it would be really tasty as a filling for calzones! Does your pizza dough work for calzones too? I haven’t tried using it for calzones, but I was just talking about that the other day! I’ll have to try it soon.